Our quality selection of luxurious and colourful Alpaca blankets have been imported from a reputable supplier in South America and they would make an an elegant addition to your home as a couch or bed throw. These exceptionally silky and plush blankets offer warmth and comfort yet are light-weight (800 grams). They are manufactured using 70% Alpaca fibre and 30% Polyester and are machine-edged for durability. Size: 225 cm x 168 cm. 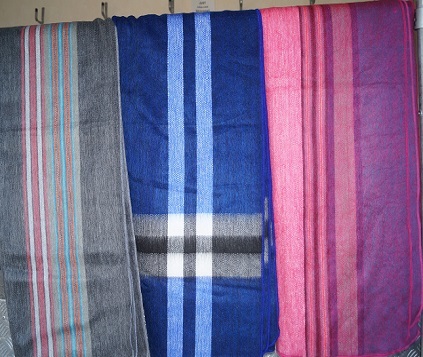 The Alpaca blankets come in a range of striped modern or traditional patterns, with a wide or narrow stripe available. Alpaca blankets should be DRY CLEANED only.